Collection represents the group of objects. Depending on the method of storing and retrieving, collections are basically divided into three parts – Set, Map and List. Where Set does not contain duplicate values, Map contains key value type of data whereas List can have a duplicate values stored in it sequentially. This framework is provided in “java.util” package. Collection is the parent interface of all collections in java. Following list describes the core collection interfaces. Collection “” the root of the collection hierarchy. A collection represents a group of objects known as its elements. Some types of collections allow duplicate elements, and others do not. Some are ordered and others are unordered. The Java platform doesn’t provide any direct implementations of this interface but provides implementations of more specific sub interfaces, such as Set and List. List “” an ordered collection (sometimes called a sequence). Lists can contain duplicate elements. The user of a List generally has precise control over where in the list each element is inserted and can access elements by their integer index (position). Queue “” a collection used to hold multiple elements prior to processing. Besides basic Collection operations, a Queue provides additional insertion, extraction, and inspection operations. Queues typically, but do not necessarily, order elements in a FIFO (first-in, first-out) manner. Among the exceptions are priority queues, which order elements according to a supplied comparator or the elements’ natural ordering. Map “” an object that maps keys to values. A Map cannot contain duplicate keys; each key can map to at most one value. If you’ve used Hashtable, you’re already familiar with the basics of Map. Hash table and linked list implementation of the Set interface, with predictable iteration order. This implementation differs from HashSet in that it maintains a doubly-linked list running through all of its entries. This linked list defines the iteration ordering, which is the order in which elements were inserted into the set (insertion-order). Note that insertion order is not affected if an element is re-inserted into the set. (An element e is reinserted into a set s if s.add(e) is invoked when s.contains(e) would return true immediately prior to the invocation). A set that further guarantees that its iterator will traverse the set in ascending element order, sorted according to the natural ordering of its elements (see Comparable), or by a Comparator provided at sorted set creation time. Several additional operations are provided to take advantage of the ordering. (This interface is the set analogue of SortedMap). This class implements the Set interface, backed by a TreeMap instance. This class guarantees that the sorted set will be in ascending element order, sorted according to the natural order of the elements (seeComparable), or by the comparator provided at set creation time, depending on which constructor is used. This class is roughly equivalent to ArrayList except it is Synchronized. 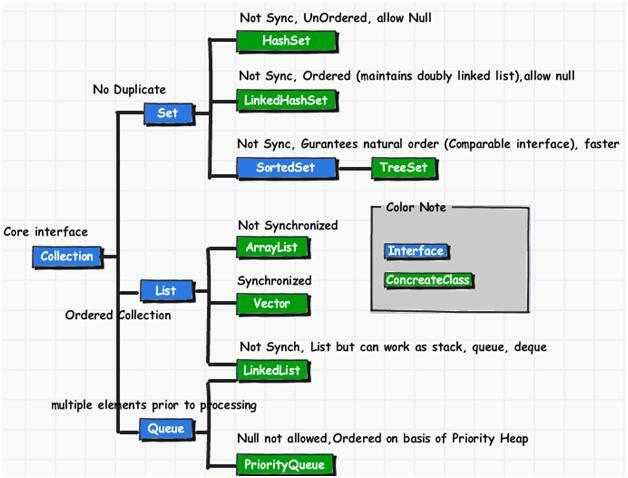 Linked list implementation of the List and Queue interfaces. Implements all optional operations, and permits all elements (including null). 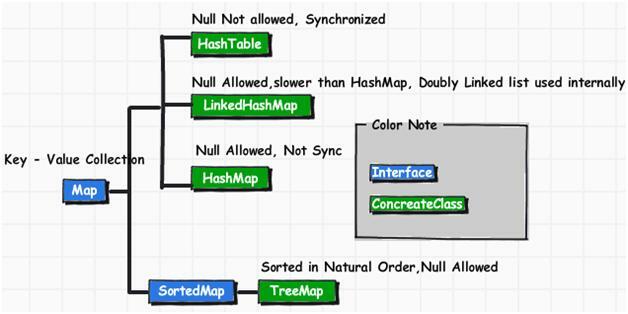 The HashMap class is roughly equivalent toHashtable, except that it is unsynchronized and permits nulls. This class guarantees that the map will be in ascending key order, sorted according to the natural order for the key’s class (seeComparable), or by the comparator provided at creation time, depending on which constructor is used. your diagram of hash table and description are different. In description you say it permits nulls. I’m tired but I think I am reading it right. Thank you very much for the information and explanation with images.